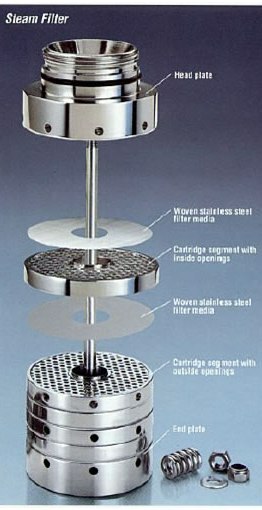 The patented segmented construction of MICROPURE filters offers significant advantages over conventional cartridge filters (shown above). Steam flows into the openings on the outside of each segment disc and passes through the filter and into an adjacent disc. Filtered steam exits through the opening at the center of the cartridge, free from contaminants that can affect the quality of your product. Steam Filters protect expensive equipment, maintain processing efficiency and reduce downtime, it’s important to remove scale and debris that are common in most systems. Steam Filters will protect valves, process equipment and process filters from damage. Steam filters from Micropure will help protect you product purity. When your steam is filtered through a MICROPURE Steam Filter, you can rest assured that your process will be protected against unwanted contaminates. Woven stainless steel filter media – supported by stainless steel segmented discs in stainless steel housing maintains its integrity under conditions that cause conventional sintered media to disintegrate. The picture below shows the difference between the two types of media. Our media (top image) traps all particles upstream on top of the media where the competitor’s filter traps and absorbs the contaminates. Our media has a one year warranty on strength and integrity and the competitor’s cartridge can disintegrate after repeated heat treatments. Unlike other filter media that have a shorter life and must be disposed or removed frequently for acid cleaning, MICROPURE filter media can be easily and repeatedly cleaned by backflushing for a full year under normal use. When replacement finally becomes necessary, the cost is considerably less than our competitors. The reason: only the media is replaced, not the entire element. MICROPURE has the filter size you need from 10 lbs/hr to 25,000 lbs/hr (at 100 psi, 32 um grade). Micropure has filters with micron rating from 1-100 to ensure that your exact requirements are met. If requirements change, you can often keep the same housing. By changing the media porosity or the number of segmented filter discs you can meet your new requirements. With MICROPURE, steam filtration is simple, effective and cost efficient. If you have a small application or a small budget the Mini Filter Series might be the solution to your filtration needs. The same great quality, segmented design and exceptional features at a lower cost to you. Case Study: There is more to filtration than filtering: Micropure presented them with a proposal for a 100 micron Steam filter that was sized specifically for their application. This will act as a pre-filter to the current culinary steam filters they have in their systems. Case Study: Finding a sustainable solution with steam: The Micropure steam filter has many advantageous features for breweries. Each media piece works independently allowing for maximum filtering capacity and extremely low pressure drop.